broadcast: In the Array "Hello World" program, the last thing the Main::Main() constructor did was tell the first element of the helloArray to sayHi(). In this version of "Hello World," Main::Main tells the entire array of Hello chare objects to sayHi(). This is done by calling Hello::sayHi() on the array itself (instead of just a single element of the array). sayHi(): The Hello::sayHi() entry method no longer has the if statement that tests if the object is the last object in the chare array. Instead, every element of the chare arrays invokes done() on the Main chare object (sends a message). done(): The Main::done() entry method is now invoked multiple times. The Main chare object has a counter, doneCount, that counts the number of times Main::done() has been called. Once this count reaches the number of elements in the Hello chare array, the program exits. numElements: Since the Main chare object is the only object that needs access to the numElements value, it has been made into a member variable of the Main chare class. The source code for this example can be found here (BroadcastHelloWorld.tar.gz). // has completed its task. // Create the array of Hello chare objects. // elements in the helloArray array of chare objects. // When called, the "done()" entry method will increment the doneCount. // completed their tasks, "done()" will cause the program to exit. // objects have indicated that they are done, then exit. // Otherwise, continue waiting for the Hello chare objects. The makefile for this program is the same as it is for the Array "Hello World" program. The only difference in the output of this program and the Array "Hello World" program is that all of the Hello chare objects are told to sayHi() by the Main chare object. This is reflected by the fact that all the output lines below have "told by -1" in them. "Hello" from Hello chare # 3 on processor 0 (told by -1). "Hello" from Hello chare # 6 on processor 0 (told by -1). "Hello" from Hello chare # 9 on processor 0 (told by -1). "Hello" from Hello chare # 1 on processor 1 (told by -1). 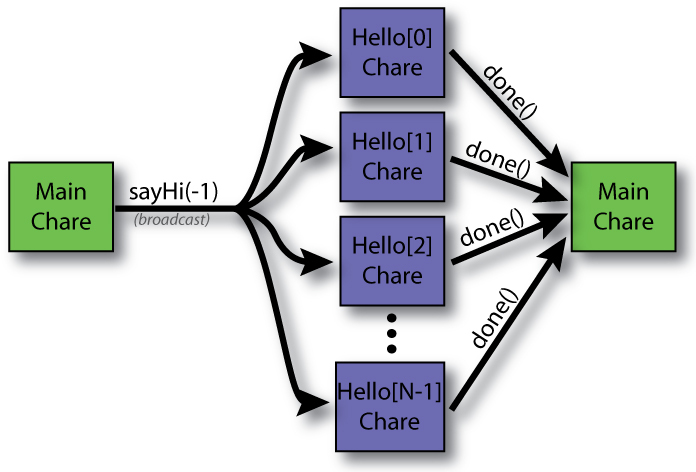 "Hello" from Hello chare # 4 on processor 1 (told by -1). 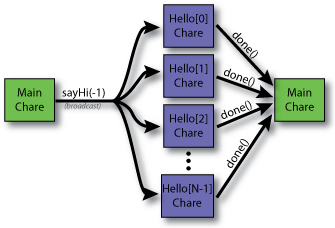 "Hello" from Hello chare # 7 on processor 1 (told by -1). "Hello" from Hello chare # 2 on processor 2 (told by -1). "Hello" from Hello chare # 5 on processor 2 (told by -1). "Hello" from Hello chare # 8 on processor 2 (told by -1).